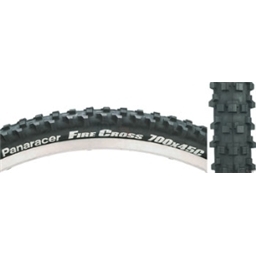 The Fire Cross is based on the award winning Fire XC Pro tread design and tweaked for wide frame cross and all 29" applications. Super aggressive and confidence inspiring. The world of gravel-grinding is sorta between cyclocross and mountain biking and it can be tricky to find the right rubber depending on your bike and actual needs. I run this on the front of a Surly Strangler, it would not fit in back and I have another brand tire back there. In deep loose gravel this tire keeps me stable and in control, that's why I chose it and has not let me down. Not good for the pavement, it is a true knobby tire and will buzz pretty bad. Wish I could get this in a 700-42, too. I'd put it out back and I'm sure that would leave me with an awesome setup.